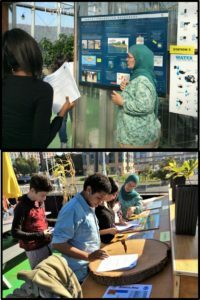 Addressing the three main themes of the curriculum – global, local, coastal – the program features field trip-based components at three different locations within Yonkers. With two rounds of programming completed in the Fall of 2016 and 2017, over 600 students from four high schools in Yonkers, NY were engaged in the pilot program. To answer these and other questions, students use data from artificial ice cores, weather stations, tree rings, global carbon dioxide records, and global temperature records that track climatic changes through time. In addition, students analyze the effects of a changing climate, including melting glaciers, storm events, expanding drought conditions, biodiversity loss, and disease. Because the Science Barge is a functioning example, the students are also exposed to solutions like renewable energy and sustainable agriculture. The global curriculum session, delivered in this initial phase to the four high schools under the NOAA grant, is now available as a standalone program option to regular classes visiting the Science Barge. The interactive exhibits are also open to the over 5,000 public visitors on weekends. 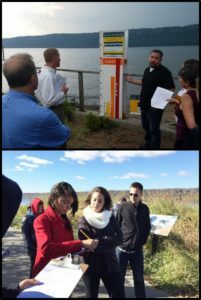 The second field trip focuses on coastal impacts of climate change. Exploring Climate Change and the Hudson River takes place at the Center for the Urban River at Beczek (CURB). CURB is located on the banks of the Hudson River, a tidal estuary that flows into the New York Harbor and out to the Atlantic Ocean. Coastal communities are home to large numbers of people densely concentrated along the shoreline and are especially vulnerable to rising sea levels. Because the Hudson River tidal surge during Hurricane Sandy did major damage, it is an important place to start understanding the climate impact on these communities. At CURB, the students use both indoor and outdoor installations to learn about Hudson River geography and history, paying close attention to storm events. They examine sea level rise, the functions of wetlands, and the impacts of ocean acidification through videos, interactive computer maps, and on-the-ground examination of storm surge levels in the tidal marsh. Students obtain a firm grasp on the impacts of climate change in the Hudson River Valley, where they live and experience the changes. The third field trip – Mitigating Our Carbon Footprint and Building Resilient Communities – takes place at the EcoHouse, a mobile classroom located at Gorton High School. The EcoHouse was set up to showcase a sustainable home with efficient lighting, energy-efficient appliances for cooking and heating, and “smart” technology for remote access to settings and measurement of all energy and water use. The exterior is landscaped as an urban homestead, including demonstration food gardens, green roofs and solar panels, rainwater collection, and options for permeable paving. The local effects of climate change differ from place to place, yet practicing energy efficiency and conservation have profound effects on reducing carbon emissions. At the EcoHouse, students explore practical behavior changes that can be made at home to save energy, resources, and water. They also learn how to increase resilience to extreme storm events in their communities through flood resistant landscaping and creating emergency preparedness kits. A day of exploration at Columbia’s University’s Earth Institute Open House complemented the 2017 program where a diverse group of climate scientists spoke to Yonkers students about career opportunities and the compelling challenges of climate issues across the world. In the next steps of the NOAA-funded project, Groundwork Hudson Valley and partners are working to develop a Distance Learning Module, including a still-in-progress web application as well as a classroom version of the curriculum, to be released later in 2018. To affect global change, local action is necessary. 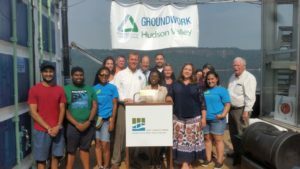 Groundwork Hudson Valley and partner organizations have created a curriculum to teach that lesson to students in a coastal area that is particularly vulnerable to extreme storm events. Groundwork Hudson Valley’s curriculum is an important step to increase climate science literacy and was developed in partnership with the Alliance for Climate Education, Columbia University’s International Research Institute for Climate and Society, and Sarah Lawrence College’s Center for the Urban River at Beczak. Overall, the program fosters an attitude of positive change and stewardship in the next generation of adults.